Cape Town - Proteas seamer Vernon Philander is not worried after a recent dip in form saw him struggle to make inroads on South Africa's recent tour to Australia. The 27-year-old burst onto the Test scene last year when he took five for 15 against Australia in Cape Town to help dismiss the tourists for 47 in their second innings and set up a South African victory. He also became the fastest man to reach 50 Test wickets in over 100 years. However, he struggled recently in Australia, taking only four wickets in the series, which was won 1-0 by the Proteas. Philander though is confident he'll be back in business in the upcoming series against New Zealand. "I've bowled a lot worse and taken more wickets," he told the Beeld website, referring to the recent series Down Under. "It happens. I feel I still bowled well, especially in the last Test in Perth. I bowled especially well against (Ed) Cowan and Michael Clarke and was lucky enough to get David Warner out with a decent delivery. "All that's really important though, is that the team takes 20 wickets in a Test. As long as I feel I've played my part, then I'm happy. One also can't expect to take five wickets in every innings." Philander will play four-day cricket for his franchise, the Cape Cobras against the Titans this weekend, which will give him valuable game time ahead of the first Test against the Kiwis starting on January 2 in Cape Town. The second Test starts in Port Elizabeth on January 11. "I feel good and can't wait for the series, especially because it’s on home soil. We had good success against them in New Zealand earlier this year and I expect the pitches here to assist the bowlers. There will be more bounce here." 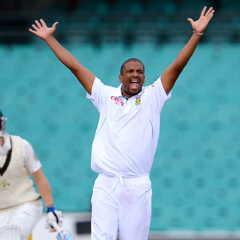 Philander has taken 67 wickets in 12 Tests at a healthy average of 17.98. - Home v Australia (2011-’12, 2 Tests) - 14 wickets at 13.92. - Home v Sri Lanka (2011-’12, 2 Tests) - 16 wickets at 12.62. - Away v New Zealand (2011-’12, 3 Tests) - 21 wickets at 15.47. - Away v England (2012, 3 Tests) - 12 wickets at 23.66. - Away v Australia (2012-’13, 2 Tests) - 4 wickets at 49.75.